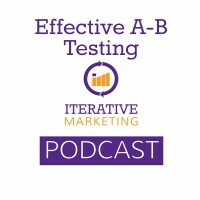 A-B testing is the core of experimentation. With the right execution, it not only provides uplift in click-through rate and conversions, but also serves as an audience insight generator. This podcast explores how six things — sample size, random sample, controls, duration, statistical confidence and testing for insight — can make an A-B test effective and beneficial to all departments in an organization. Tools for A-B testing (Optimizely, Convert, Google Optimize) are becoming more user-friendly. Many testing tools are embedded in platforms like Marketo and Pardot. Sample size calculators can help you determine how big of an audience you need to achieve 90% or 95% confidence. Marketers should not attempt a test if you are not going to have a big enough sample. It’s important to determine this BEFORE you start the A-B test to not waste resources. 2) Random Sample (9:43 – 11:42): Sample must not only be large enough, but it must also be segmented randomly. 3) Control (12:32 – 17:10): The efforts put in place to make sure the thing being tested is the only thing that’s different between the experience of those getting version A and those getting version B.
Ex: Running a test Thurs-Mon favors weekend habits, while running it Mon-Thurs favors weekday habits. Usually represented as a percentage, which represents probability. Ex: If results are 95%, it means if you ran the same test 100 times, you’d expect 95 of those to work out with the same winner. Marketers usually strive for 95% confidence, although we have taken the results of a test with 90% confidence as usable information, or as a good working hypothesis until a better test can be run. 6) Testing for Insight (21:36 – 26:12): Learning more about our audience beyond gaining an increase in click-through rate or conversions. The best A-B tests test the psychographics of an audience segment to gain insight that can be applied to multiple departments in an organization. To get started, brainstorm a hypothesis for how you expect your audience to act and why. Then, build an A-B test to validate or invalidate that hypothesis. This hypothesis is not audience-specific and is very specific to this piece of content.